In 1911, President Taft signed the Weeks Act authorizing the federal government to acquire land from willing sellers to protect watersheds and restore forests east of the Mississippi. Thanks to the effort, the ridges surrounding Curtis Creek near Old Fort are still pristine woodlands. In fact, Uncle Sam’s first purchase was an 8,100-acre tract that protected the Curtis Creek watershed and became one of the first parcels of Pisgah National Forest. Explore the East’s first tract of national forest with a hike from Curtis Creek Campground to Snooks Nose. 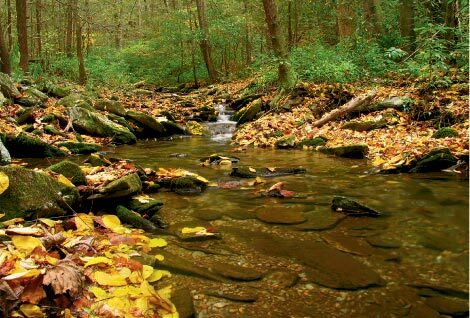 From the road, the rocky and underused path soon crosses Slick Falls Branch stream, then climbs steeply. In just more than a mile, pass to the right of a large rock outcrop that resembles the profile of a nose, although this isn’t the namesake sniffer. Continue winding up broad switchbacks and gain a narrow rocky ridge, presumably Snooks Nose, with great views through a stand of stunted and twisted pine trees. To the west is the elegant profile of Iron Mountain and below is the Newberry Creek watershed. Navigate: From downtown Old Fort, take U.S. 70 east approximately 1.8 miles and turn left on Service Road 1227. Travel five miles to Curtis Creek Campground. Find the trailhead on the left 0.4 miles beyond the campground gate. Between January and March, park at the locked gate and walk to the trailhead.